How does drug use break down by age in the United States? 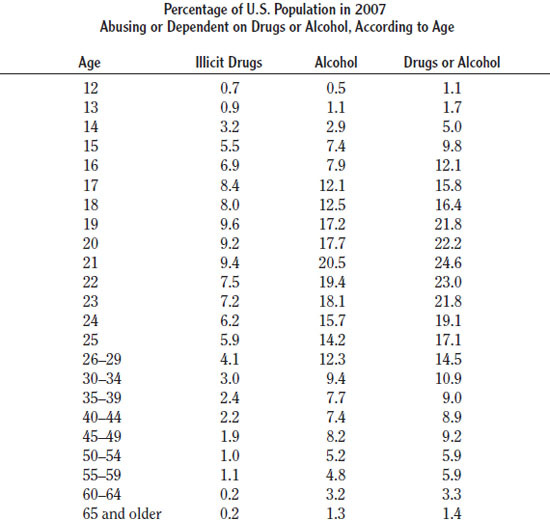 The table below shows the incidence of substance abuse or dependence in 2007, both for illicit drugs and alcohol. As is clear in the chart, substance use disorders start in the early teens, peak at age 21, and then subside after that. The abrupt decline after age 21 is consistent with research suggesting many people conquer their substance problems without treatment. These data come from the 2007 National Survey on Drug Use and Health for subjects aged 12 or older, conducted by SAMHSA of the U.S. Department of Health and Human Services. Classification of substance abuse and dependence is based on DSM-IV diagnostic criteria.